The Triscele, symbol of Sicily, finds its origins in the greek mythology. It represents a head of a Gorgon, whose hair is entwined serpents with ears of wheat, and from which three bent legs branch off with its feet pointing in the same direction. Gorgons are mythologic characters, monstrous-looking with snakes in place of hair, teeth like boar fangs, hands with bronze claws and golden wings. They could petrify anyone who looked directly into their eyes. The Gorgons were three sisters: Medusa (the most important one and guardian of the underworld), Euryale and Steno, daughters of the sea gods Forco and Ceto. 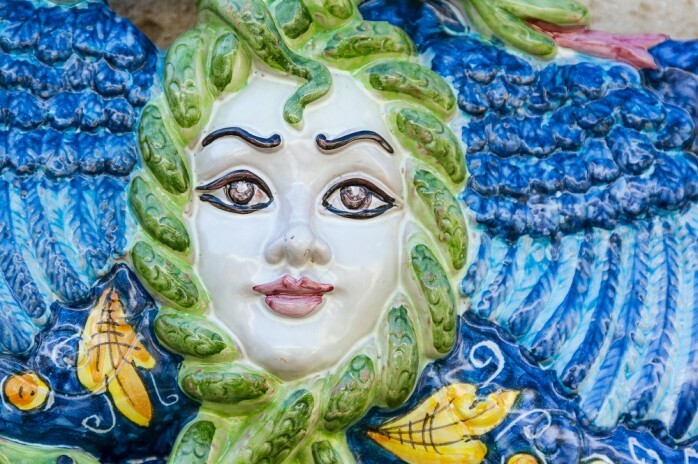 Thay represented perversion in its three forms: Medusa was the intellectual, Euryale the sexual and Steno the moral perversion. The ears of wheat, introduced by the Romans, symbolize the land abundance and fertility and the rank of “breadbasket” of the Roman Empire. The position of the three legs, with the feet pointing in the same direction, suggests a rotational motion. This has led to believe that the Triscele represented the sun (or the weather god Baal) or the moon with scythes instead of legs. In any case, this symbol, which had a religious value in its Eastern origin, became in Sicily a geographical one. The three legs represent the three promontories of the island: Capo Peloro (Punta del Faro, Messina: North-East), Capo Passero (Siracusa: South), Capo Lilibeo (or Capo Boeo, Marsala: West). This particular reference is found in the greek word triskeles and connects to the geographic meaning: treis (three) and akra (promontory). In Latin too, triquetra (three vertices). The Triscele is at the center of the official flag of the Region of Sicily. 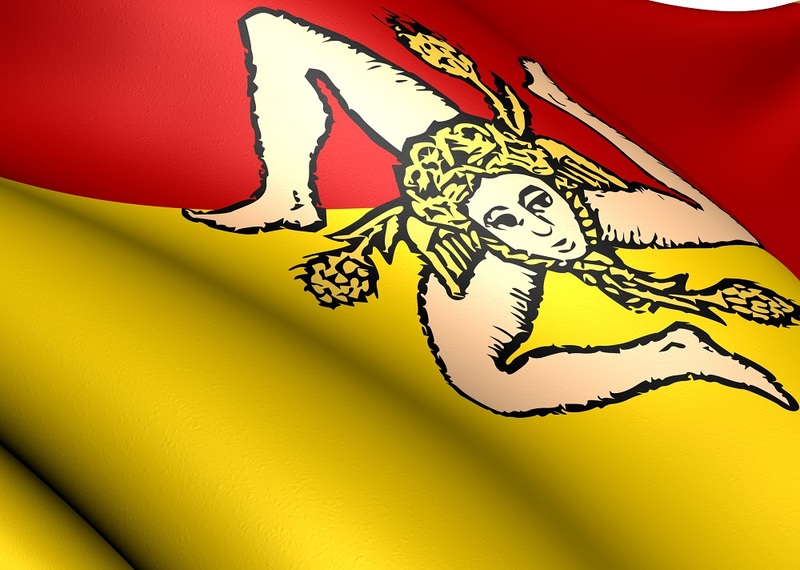 The flag was adopted for the first time in April 3, 1282 during the Sicilian Vespers and symbolized the unity of Sicily in expelling the Angevins. The colors of the flag are red and yellow. The first is the color of the Municipality of Palermo and the second of the one of Corleone, at that time, the largest agricultural capital of Sicily. Curiosity: The Spartan warriors used to carve a white bent leg in their shields as a symbol of strength, a proof of which can be found in many paintings on ancient vases. The Archaeological Museum of Agrigento hosts one of these specimens: an Attican amphora with black figures representing warriors, attributed to the Painter of Edinburgh in the late sixth century B.C.